I'm not done with my holidays yet! After my 2 weeks in Vietnam, followed by a few days of rest in Hong Kong, I'm off again. I'm spending the next 2 weeks on another trip, travelling from Bangkok up to north Thailand, and then through Laos until we finish in Vientiane. I've never been to either country before, and this tour in particular seems to cover everywhere I want to go in Laos. I'll likely come back to Thailand at some point to do the south, but since you tend to have to start in Bangkok most of the time anyway, it's pretty easy to split the country in half like this. Speaking of Bangkok, this is where the trip began (did you guess from the title?) and we actually got to spend a day and a night here, which was good, as often with these trips you have to book an extra night or two if you want to see the departure and finish cities. I flew direct to Bangkok from Hong Kong, but by the time I landed and got to the hotel, there were only a couple of hours to wait until the welcome meeting, and since we were a bit far from the main sights, some of which were already closed, and a rainstorm chose that moment to pour down, I opted to just wait in the hotel for that time. At the welcome meeting we went through all the formalities, and then the 14 of us and our tour leader went out for our first dinner together, walking to a place just down the road from our hotel, in the Sathorn area of Bangkok. While there are some similarities between most Asian cuisines (rice and noodles in particular! ), I do like it when I feel like I'm getting something a little bit different, so after 2 weeks of Vietnamese cuisine, it was refreshing to see things like curries, pad thai, and tom yan soup on the menu. Most of us called it an early night though, after much travelling time and the prospect of the 2 weeks of busy days and lots of activities ahead of us. The next morning we awoke fairly early (although to be honest, anything before about 9am is early in my book) and went down to the river to catch the boat into the city centre. The boat, as well as the Sky Train (which I didn't actually need to use), are the easiest ways to get around the city, to avoid the crazy traffic jams on the roads that can leave you stuck for hours. Fortunately, that didn't happen to me during my taxi ride from the airport to the hotel, but it was definitely good to know for the remainder of my time in the city. Having our tour leader take us n the boat was definitely a big help, so we knew where to get on and off, but we also had to try to pay attention to get back ourselves later on. We stayed on the boat longer than most of the other tourists, who got off by the Grand Palace, and instead got off a couple of stops later, where we would then board a long tail boat for a cruise through the canals. The Chao Phraya river is so wide, and lined with many large buildings and famous sights of the city, but the canal is entirely different, instead boasting dozens of stilt houses for the most part, alongside many temples (Thailand as a whole, has many, many temples!). The houses were all quite small and simple, homes to some of the city's poorer residents, but we saw many locals going about their daily business in them, including fishing straight out of the canal from their balconies. There were large schools of fish at various points down the canal, which you can feed from the boat or the riverbank; they'll attack whole loaves of bread thrown in! Eventually the long tail boat circled back to the Chao Phraya river, and dropped us off outside Wat Arun, also known as the Temple of Dawn. In all honesty, based on pictures I'd seen, I was expecting this to be much larger! It also had some scaffolding around it that day, but it was still clear that so much work had gone into its creation, with beautiful, intricate designs all over it. We wandered around the exterior, taking photos, and then jumped on yet another boat to cross the river. 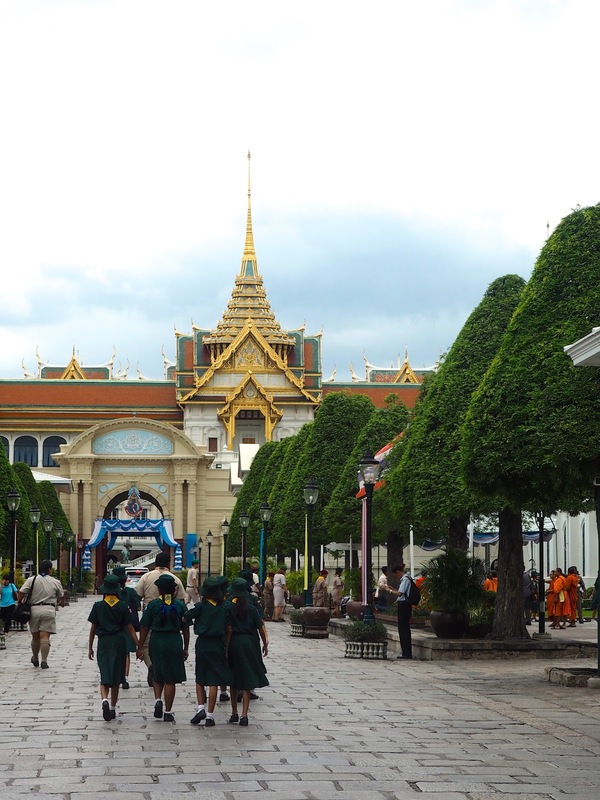 On the other side there is the Grand Palace and Wat Pho, some of the major tourist attractions of Bangkok, and which seemed like the logical choices of things to do when you only have one day in the city! With more time I would have probably explored Khaosan Road and Chinatown, but I thought I'd stick with the big cultural stuff to start with. Wat Pho was the first stop, home of a truly gigantic Reclining Buddha statue, which is basically impossible to fit into one photo! This is the highlight of this temple, walking around the hall and admiring the golden statue from all sides, but there's many more buildings to the complex besides that, with ornate decorations and towers spiralling high into the sky, and golden Buddha statues everywhere. 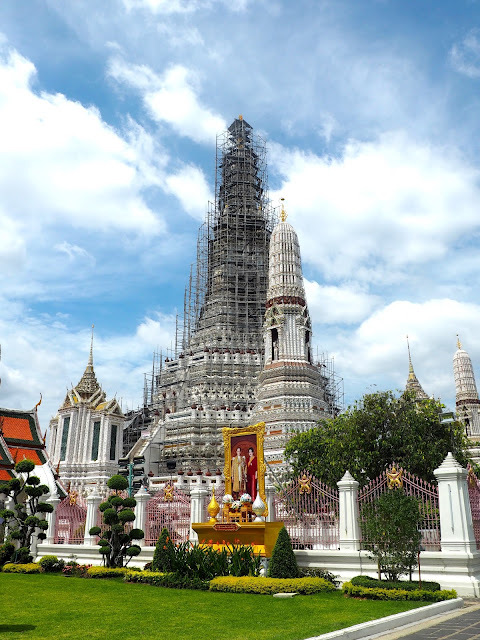 Having visited several countries in South East Asia now, some of these temples can start to all look the same (though they are all beautiful), but Wat Arun's exterior and Wat Pho's reclining Buddha do make these two stand out amongst the others. After finishing roaming around the Wat Pho complex, I thought I'd check out the Grand Palace, but annoyingly, I couldn't. It was Mother's Day and the Queen's Birthday, so the Palace was closed to tourists after midday, and only the locals were allowed inside. I walked around the walls of the palace to make sure I wasn't missing another entrance or something, but there was simple no access that day. Based on the reviews from others, and pictures I've seen, it isn't a massive loss, and it looks pretty similar to the palace in Phnom Penh, but if I do make it back to Bangkok some day (perhaps before travelling to the south), I can try to see it again then. This had left me fairly tired and frustrated, so I stopped off for a coffee and a bite to eat, before catching the boat back to the hotel. The group had all split off to do different things by this point, and while I've had to navigate foreign cities alone before, I was still pretty impressed with myself for managing to get back by myself! There was no dinner outing that evening though, as we had to head to the train station, to get our overnight train bound for Chiang Mai. I was curious to see how the Thai trains would compare to the Vietnamese ones I'd already experienced, and we had a big 13 hour journey ahead of us. The Thai train was much cleaner and more modern than those in Vietnam (no cockroaches this time!) and rather than separate compartments, we each had a pair of seats between two along the hallway, which could be cleverly converted into beds later on, made up for us by the staff, and all with clean bedding. The food was better on this train too, but there's no alcohol allowed (unlike the Vietnamese ones!). The beds were comfy too, but the biggest downside was that being along the hall meant you were more likely to hear noise from other passengers, though no one stayed up that late, and you couldn't turn off the lights, and pulling the curtain alongside your bed didn't make it that much darker. I didn't get very much sleep because of the light, but I hadn't really expected to anyway. All in all, Bangkok was interesting to experience, as it wasn't as busy and hectic as I'd expected (though that's coming from someone who lived in Mongkok for a year), but still felt like many of the other big cities I've been to in Asia. I'm glad I got to see some of it, and there's still a few parts I'd like to visit if I'm back again, especially since I felt like I only experienced the tourist area and sights, and not so much of the rest of the city, but it's not a place I would choose to spend lots of time anyway, since I want to get away from these big, busy cities when I'm on holiday. It's certainly interesting to see the mix of old, traditional sights, and more modern buildings, and the rich and poor living right next door to each other (there aren't really regions of the city separated by wealth), and Thailand is one of the parts of Indochina that was never really colonised, so there isn't that European influence that I noticed in Cambodia and Vietnam. Anyway, now we've left the capital, and north we go! If you're interested in visiting Bangkok, you might like to look at some of the tours and activities offered by Trazy Crew in the city - these are their Top Things To Do in Bangkok. I didn't use them during my trip, but I am an affiliate for the company.